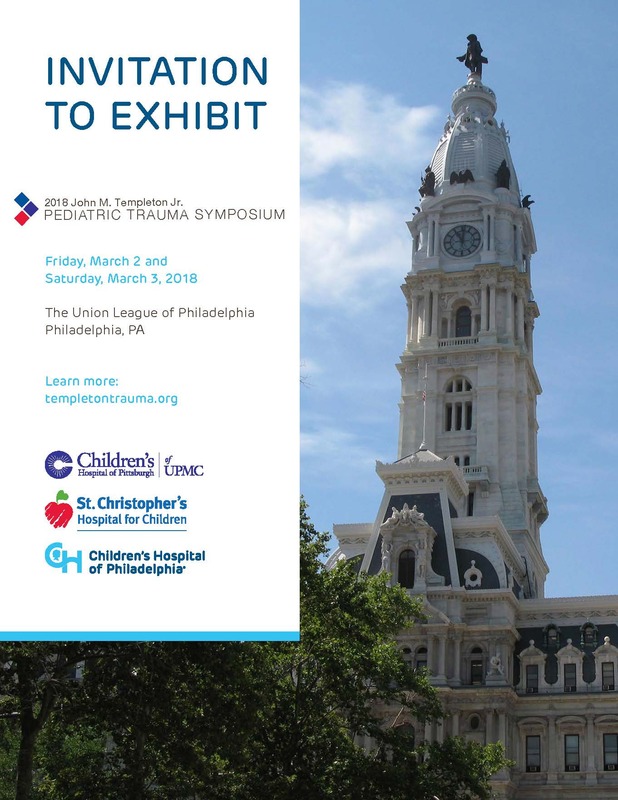 Children’s Hospital of Philadelphia, Children’s Hospital of Pittsburgh of UPMC and St. Christopher’s Hospital for Children announce the Annual John M. Templeton Jr. Pediatric Trauma Symposium. Trauma is the leading cause of childhood death and disability. However, pediatric trauma care continues to provide significant and unique challenges. This two-day national symposium will provide the healthcare practitioner with up-to-date clinical information for the management of injured children and their families. Current issues will be addressed across the continuum of trauma care. Since its inception in 2001, the John M. Templeton Jr. Pediatric Trauma Symposium has grown to be a nationally recognized resource for cutting-edge as well as basic multidisciplinary pediatric trauma education — a one-of-a-kind conference. Describe current treatment and technological advances that decrease pediatric death and disability. Discuss how trauma affects the physical and emotional future of the pediatric patient. Identify strategic measures to reduce the incidence of pediatric traumatic injuries. Children's Hospital of Philadelphia is accredited by the Accreditation Council for Continuing Medical Education (ACCME) to provide continuing medical education to physicians. Children’s Hospital of Philadelphia designates this live activity for a maximum of 14.0 AMA PRA Category 1 Credits™. Physicians should claim only the credit commensurate with the extent of their participation in the activity. Note: The optional lunch sessions held on Friday and Saturday are accredited for 1.0 AMA PRA Category 1 Credits™. 11.0 hours of credit qualify for Part 2 of the ABS MOC, Lifelong Learning and Self-Assessment. Application for Continuing Education credits has been submitted to the Pennsylvania Department of Health Bureau of EMS through the Children’s Hospital of Pittsburgh of UPMC. Your CEUs will be applied to your Status Report within two weeks of the conclusion of the symposium. Providers from other states will be provided with a certificate of attendance. Children’s Hospital of Philadelphia is a pre-approved provider of continuing education credits for Pennsylvania Licensed Social Workers, Marriage and Family Therapists, and Professional Counselors. Participants licensed in Pennsylvania who attend the full workshop and complete the required evaluation are eligible for 12.5 Continuing Education Credits. Participants licensed in other states should check with local licensing boards to determine continuing education approval. The Society of Trauma Nurses TOPIC course is taught to all members of the trauma system team who participate in the assessment, evaluation and improvement of trauma care. The course offers practical application for all levels of trauma centers, from entry level to mature phase of program development. The modules are taught with a focus on didactic, operational definitions, sample tools, case study examples and take-home points. A block of rooms with reduced rates has been reserved at the following hotels. Participants are required to contact the hotel directly to make their own reservations. Please mention the conference name when calling. The Inn at the Union League (215-563-6500): The group rate is $225 single and double occupancy, plus a 7 percent room tax. This special rate will be available until Wednesday, Feb. 28, 2018. Doubletree Hotel Philadelphia (800-222-8733 or 215-893-1600): The group rate is $169 single and double occupancy, plus a 15.5 percent room tax. This special rate will be available until Monday, Jan. 15, 2018. Balloon Aortic Occlusion in Children: Is This Another Hammer Looking for a Nail? Major Vascular Injury: Are You Prepared? Contrast Ultrasound for Blunt Abdominal Trauma: Prime Time to Implement! Scoring System: Managing Solid Organ Injuries Should We Throw Out the Grade Book? The Impact of Pediatric Trauma on All of Us! Is it PTSD? The Injured Child: Has 40 Years Made a Difference in Pediatric Thoracic Trauma Care? Friday, March 2, 2018 • 7:30 a.m. – 5 p.m.
Saturday, March 3, 2018 • 7:30 a.m. – 3 p.m.
Time has been allotted in the agenda for attendees to visit the exhibit halls. Space will be assigned on a first-come, first-served basis. Additional company representatives may attend for $75 per day to cover food costs.